Singing Results.com | Results Are Everything! NO RISK - 100% GUARANTEE - MADE in the USA! Instant feedback cuts through the “tonal soup” so your brain can automatically associate correct pitch. Start with Single Notes, work through simple scales and triads in both major and minor keys, and more complex patterns for more advanced vocalist. Hitting the right notes builds confidence you can be Proud of! Using a variety of instruments improves overall Pitch Matching Skill and with 128 instruments, you’ll find fun ways to challenge yourself. Over 4 hours of video singing lesson with practice audio downloads. The missing link! (see below for more details). Subject: Use this New Technology to start singing on pitch in 10 minutes. Do you want to know if you are singing off pitch? Do you want to fix it? If so, then this page is for you! If you ever wanted to know if you were singing on pitch or not, then this page is exactly what you have been looking for. If you already know that you have problems with singing on pitch, this page is 100% ABSOLUTELY for you and will help you improve in just 10 minutes! But, if you are like me and most other singers, you may have fear that at times you sing poorly – off pitch, bad tone quality, wrong words, wrong timing. Do You Want a Big High Range that is “Off Pitch”? Sing On Pitch in a Confident Range? You want both, but let’s not forget which is more important. The #1 problem reported by singers and singing teachers is voice PITCH! It’s just a matter of how far off pitch and for how long. If you’re a “tiny bit” off pitch for a short time, it’s not a big deal. But, if you remain noticeably off pitch for a half second or more, it can be a BIG problem. Ever seen or heard of AMERICAN IDOL? What’s the biggest issue with the singers on that top rated TV show? They’re off pitch! Pitchy singing kills the hopes of many contestants. Have you seen the devastation on their faces when they discover for the first time they sing off pitch? Right there on TV for “all the world” to see! How can it be that hundreds of those people thought they had what it takes to compete, when they were so badly off pitch? Your boyfriend, girlfriend, or spouse won’t tell you because they’re simply captivated by their love for you and can’t hear properly. (aside: an interesting phenomenon occurs after about 10 years of marriage where your spouse will develop magical powers to point out when you’re off pitch even if you’re not). Your voice teacher may not mention it, because they don’t want to squash your ambition (it is true that many singers are CRUSHED to learn that they sing off pitch, after years of hard work, including years of private singing lessons). One of the biggest problems for vocalists is that you can not hear yourself properly. The sound from your voice travels through various parts of your head to reach your eardrums. Sound waves get “morphed” when going through different densities of soft tissue, open cavities and bone before they reach your eardrum. This means that what you hear is different than what others hear – you can’t hear yourself accurately. Having a cold, even eating dairy can alter your singing pitch. Research in major university laboratories consistently confirm that even expert professional singers can not tell when they’re singing on or off pitch. In one experiment professional singers where asked to sing a short phrase and immediately “grade” whether they were on pitch or off pitch. They then listened to a recording of their performance and again “graded” their voice pitch. When listening to the recording, they graded their singing pitch 100% accurately. When grading immediately after performing (ie, this is what they thought while performing), there was ZERO CORRELATION between their answers – this means it was a TOTAL CRAP SHOOT for professionally trained vocalists! If top trained professional singers can’t tell, it’s no wonder that YOU and I can’t tell when we’re singing off pitch. The only way to tell if you are off pitch is to have objective measurement device that tracks your performance and gives you immediate feedback. PitchPerfector™ is objective, WILL NEVER LIE TO YOU, and gives you immediate feedback. Work on and FIX your voice pitch problems in the privacy of you own home not while singing in public. All accomplished vocalists know that singing pitch is a real issue. If you think you have no singing pitch problems, you may want to get a second opinion. For now, let’s talk about the first steps toward correcting singing pitch in as quickly as 10 minutes. At the age of 4 years old, I decided that I wanted to be a singer. I sang in every event that came along, in junior high and high school, I sang solos, barbershop quartets, big choirs, special small ensembles… awards upon awards, I developed an excellent voice. But, my confidence was weak when I went to college and I felt I could not make it as a professional singer, so I got a degree in mathematics and computer science and became a software engineer for a very long time. One day I decided to give up my high paying career and “go for it”… I knew I needed training, so sold my house, cashed in my retirement, savings and “poured it all” into getting a top notch education at a great music college. After the first year of training, I sat down for an intensive session with a new voice teacher who had heard me sing for several days at a singing retreat workshop. He said, “we could work on several things… Your vocal pitch issues or …” I didn’t hear a word he said after that. I was SOO EMBARRASSED. Here I had given up a comfortable life to become a professional musician and I COULD NOT SING ON PITCH! I was mortified, humiliated beyond belief and considered dropping out of school. But then, I got it together and decided to get in to action. I started taking two private voice lessons a week. I bought every voice training program on the internet I could find. I bought programs to teach me to hear perfect pitch and relative pitch. And, I got a lot better over the following two years. Then, feeling confident, I came to perform for my Junior Jury (this is where all the professors sit and listen to you perform and “grade” your performance – it’s cut-throat – not mean, just brutally honest). I did the best I could do and walked out of that jury, fully confident in my success! My pitch was better, but not enough to pass! Do you know a friend who needs PitchPerfector™? Are YOU tone deaf, but want to help your children sing on pitch and avoid embarrassment? Back to the drawing board… or internet in this case… I stumbled across a little vocal software program that would “graph” a single voice pitch. I could play a pitch, then sing, and it would draw lines showing where my voice pitch was. The program cost only $39 and only did this one simple thing, but this was my SALVATION! I started running tests and discovered that I was more off pitch in different parts of my range. I also discovered that my singing pitch was consistently more off pitch on particular notes in a key. For example, in the key of C, I was more often sharp on the G (5th) and flat on the E (3rd). And, this also varied depending on the area of my range. Over time, I developed a unique profile, or signature for my voice pitch reliability. …. And PASSED my next jury!!! As helpful as that little program was, it only ran on my iMac (not on my PC laptop) and it just didn’t do what I wanted and wasn’t even designed for vocalists. It was more of a singing pitch software “tuner” sort of thing with no options at all. My vocalist software was working fantastically for me, so I asked a bunch of friends to give it a try. Then I sent it to a few hundred other people to get their objective feedback. The results have been AMAZING and FAR BEYOND EXPECTATIONS. Eight years later, here's a screenshot of v4.0. Because this was designed specifically for vocalists, it is easy to just “play around” with it. Reports started pouring in about HUGE improvements within a couple of days. Further, almost everyone noticed improvement within the first 10 minutes. This was UNEXPECTED REVOLUTIONARY NEWS! How could people be improving their voice pitch this quickly? I expected it to take weeks, or months! #1 – we’re still trying to figure it WHY it works. We just observe that it does work. #2 – we speculate that it’s because singers, for the first time in their lives, get immediate and accurate feedback! So, WITHOUT EVEN TRYING, they start adjusting their voice and their vocal pitch improves. Of course, there’s much more to this voice software for singing and training system than just “playing around”, but the fast improvements are impressive. I wish I had a better explanation about WHY and in another 6-12 months of research I’ll probably have a better answer. But for now, we just know that it works and I wanted to get this good news out to you as soon as possible. Now, I want to be fully honest with you. You may not solve all of your singing pitch problems in 10 minutes. While You will get immediate improvement within 10 minutes, many voice pitch problems require extra practice. Short, easy to follow videos show you how. After you know your vocal pitch “signature,” you will use PitchPerfector™ to train your voice and your ear to address your specific singing pitch problems. 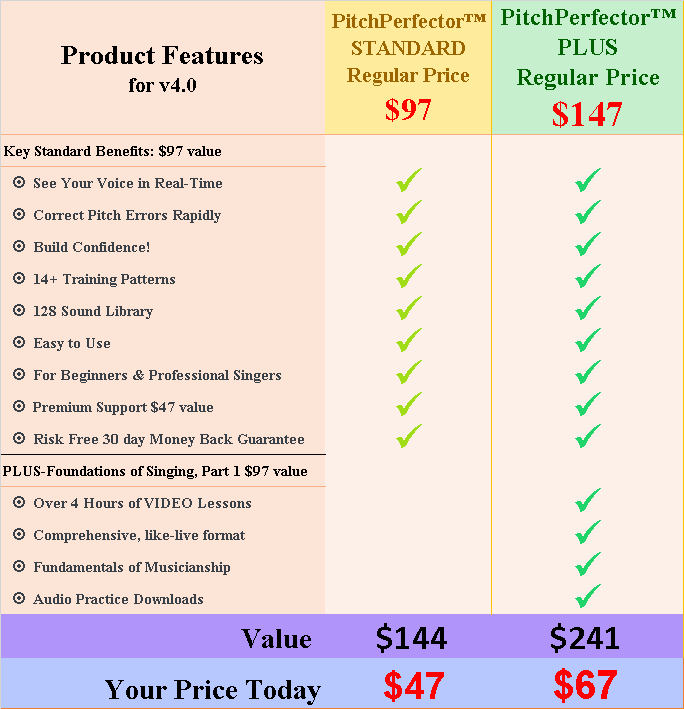 EVEN IF YOU HAVE A TEACHER who is good at helping students improve voice pitch, you will wantPitchPerfector™ to measure your success objectively (odds are when your teacher sees this program, she/he will start using it during your vocal lessons). So far, PitchPerfector™ has worked every time, with everyone, and it will WORK FOR YOU! ATTENTION PARENTS: Work with your children “OBJECTIVELY” – Don’t be the BAD GUY trying to help your son or daughter with their singing pitch! Your child can see the results themselves with PitchPerfector™. How do YOU know if you sing on pitch? With twenty years experience as a software engineer, a degree in vocal studies, and in a graduate degree program for music technology, you can imagine that I have access to pretty much any voice software around for analyzing vocal sound. In my private studio, I instruct and record top vocalists using the same the tools used in top recording studios around the world. For years, I sought out every program I could find to solve [my] singing problems, so I know what’s available and what’s not. PitchPerfector™ was created for YOU because, frankly, you need it. That may sound harsh, but honestly, every vocalist needs it! Few vocalists have the $50,000 of voice software that I have in my studio to analyze their voice (and that stuff is very complicated to use, so even if they have it, they need this program because it’s quick & easy). I took all of my experience, of twenty years of programming, a degree in vocal studies, masters program in music technology and in-depth graduate research on vocal pedagogy pitch problems, and created this easy to use voice pitch software program to give you a FAIL-PROOF BLUEPRINT you can use TODAY, to start fixing you own singing pitch problems within 10 minutes. Find out how bad your voice pitch problems are immediately. Get training sessions that show you how to use the PitchPerfector™ to build a unique “signature” profile of your voice – everyone is different. If you’re vocal pitch is not too bad, then tweak to perfection. You may immediately enjoy more confidence. Get noticed by your peers. Expect compliments on your singing! If your vocal pitch is already great, use PitchPerfector™,to reach the next level. Test yourself – everyone has good and bad voice pitch days for a variety of reasons. Best to know before you go on stage rather than to learn after the performance when you hear the recording. You will have Confidence that you won’t be embarrassed the next time you sing. Free from singing softly in the background hoping no one notices. No more lip-syncing! Sing LOUD with pride! You will never have to worry about your friends or others talking behind your back about how off pitch you are. A Prominent Voice Teacher in San Diego wrote last week… "Rebeca here from my personal email. I LOOOOOOOOVE your system. My students are vocalizing sooooo much (50%) more because of your brilliant system." Two of HeartSong’s leaders purchased PitchPerfector™ previously and we were shocked to see that our own pitch was not what we thought it was. UsingPitchPerfector™ just a few minutes a day has helped us both tremendously. ”Being a graduate of The Boston Conservatory, I had always considered myself to be a great singer. But it wasn’t until my senior year that I was told by the jury panel I had some “minor pitch problems.” As you can imagine, I was quite upset considering how much pride I had always taken in my singing. The revelation stayed in my thoughts, and even after I started booking high profile singing and acting gigs, it still affected my confidence. The worst part about it was I had NO WAY to monitor my pitch! A music director could give me a correction, but I still felt absolutely powerless. So even if I was singing perfectly in tune, my performances would sometimes lack the commitment that makes them memorable for an audience. Julian R. Boston Conservatory Graduate Class of 03? Get More with PitchPerfector Plus! While the standard PitchPerfector System will work wonders, most people find it helpful to have some fundamental knowledge of singing. With PitchPerfector Plus! 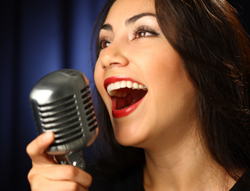 we add EXPERT Singing Lessons to establish a Foundation for your Singing. Each lesson is much like a 1 on 1 lesson would go in a voice teacher studio. You will enjoy these Easy, Fun lessons that will take you further than your expectations. Unique format is as close to a live 1 on 1 lesson as possible. Musicianship, Pre-lesson preparation, in addition to core vocal training. Over 100,000 Students, Rave Reviews. You’re in good hands with this time tested program. Go through each lesson as often as you like in the privacy of your own home. Download audio tracks of your weekly lessons to take them anywhere you go. Learn first hand from expert vocalists – inspiring and motivational! If you and I were just “hanging out” talking, you might have some questions about whether PitchPerfector™ will really work for you. Since we’re not sitting face to face, let me answer a few commonly asked questions. Causal singers will gain the biggest benefit of all. Here’s why – you see, casual singers usually sit in the background, sing softly and try to avoid being noticed. It probably started when you were young and someone said you could not sing and it “stuck.” Later in life you may have tried to sing, but hit a bad note and all eyes turned on you – again reinforcing the myth that you could not sing. Using PitchPerfector™, in a short time, you may gain confidence to sing in casual settings, and gain that level of joy without caring about singing in formal venues. If you are completely tone-deaf and can not hear any difference at all between a high note and a low note, then this program is probably not of value for you. If most of the time you can tell the basic difference between a high note and a low note, then, this program is right for you. Our experience shows that you will likely get positive results of improved singing pitch within the first few minutes of using the program. This may happen within 30 seconds, but it is likely that within the first 10 minutes, you will notice improvement. However, you should not expect to resolve or fix all of your vocal pitch problems within 10 minutes. Everyone is different and there are many root causes of voice pitch problems. PitchPerfector™ is critical in understanding where you are and helping you to see your progress. 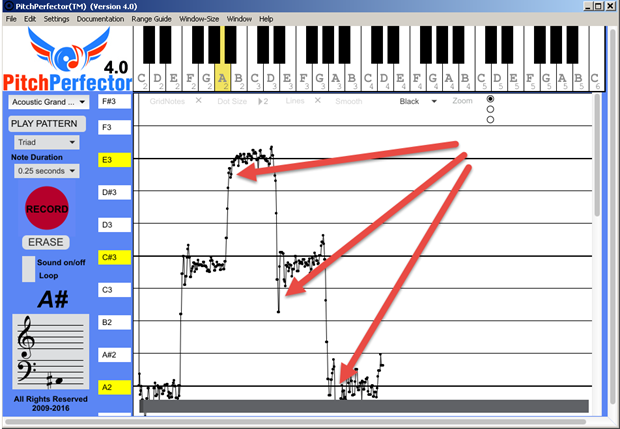 With the specific training sessions, PitchPerfector™ is further critical in improving a variety of voice pitch issues. 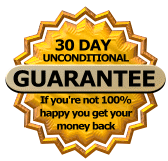 Remember you have a 100% satisfaction guarantee. The answer is that if you can afford a private teacher, that’s great. And most teachers can give tips to improve voice pitch. However, there’s a big difference in seeing your voice pitch with your own eyes and most voice teachers would love to have a vocal pitch software tool like PitchPerfector™. If you’re voice teacher is keeping up with new developments in vocal pedagogy, then they’re probably already using PitchPerfector™ and recommending it to their students. You get all future updates to version 4.x. (v3.x customers enjoyed over 5 years of free updates). IRON-CLAD GUARANTEE: If you don’t like PitchPerfector™, just delete from your machine, and send me a message within 30 days of your order with the subject line asking for a refund and I’ll promptly cancel your free future updates, refund 100% of your money, and apologize for wasting your time. Imagine what would happen if you could start singing on pitch with confidence, not a month from now, not 10 days from now, but today! Imagine 30 minutes from now, you identified your biggest vocal pitch problem and already see how to fix it! The sooner you get your copy of On Pitch Singing, PitchPerfector™, the soon you can make it happen. I want you to sing on pitch and be happy and confident with your singing. Get PitchPerfector NOW! I understand I will receive Version 4.0 today! I will also receive future updates in the 4.x series as they become available. I will also receive detailed, step by step, training videos that show how to usePitchPerfector™ to solve specific voice pitch singing problems. I get instant access. I can be using On Pitch Singing – PitchPerfector™ Vocal Software in less than 2 minutes, even at 2am on Sunday. YES! I want to take action to sing on pitch with confidence using On Pitch Singing – PitchPerfector™ Vocal Software for Singing. 30 DAY NO RISK GUARANTEE: If you don’t like PitchPerfector™ for any reason, just remove it from your computer, and send me a message within 30 days of your order for a full refund. You might not even know you sing off pitch, but others do. The longer you wait to get started, the longer you will sing off pitch. 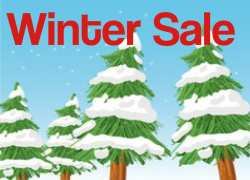 Give yourself this gift to sing on pitch with confidence and order today. PS: If you’re skeptical that you can start singing on pitch in 10 minutes, take me up on my 30 day money back guarantee. Get the Program. Go through the training. If you don’t see the value, just ask, and I’ll rush you a 100% refund. MADE in the USA! – Every aspect of PitchPerfector™ was created in the USA. This includes the research, software design, development, marketing, webhosting… even the software programming tools used to create PitchPerfector™ were developed in the USA. Stay tuned for the next FREE updates to this product, including step by step daily training, and video instruction on the history of tuning issues in music (a must have for any music student). If you don’t like PitchPerfector™, just delete from your machine, and send me a message within 30 days of your order with the subject line asking for a refund and I’ll promptly cancel your free future updates, refund 100% of your money, and apologize for wasting your time. Instant Access – Download NOW! PitchPerfector v4.0 today! … future updates in the 4.x series as they become available.